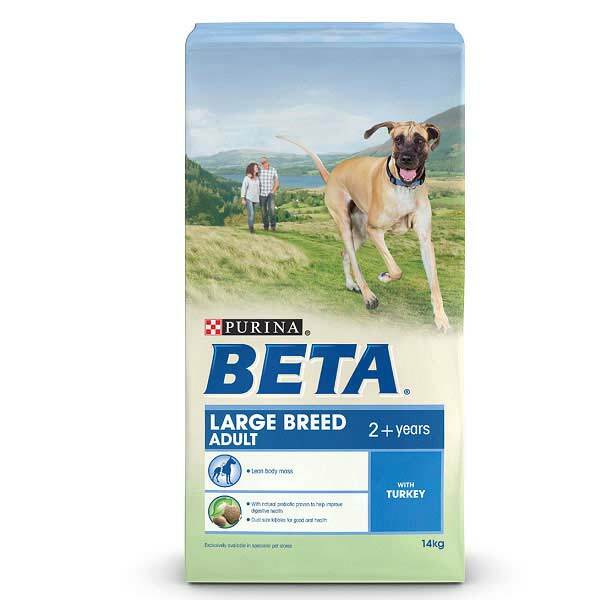 BETA Adult Large Breed with Turkey and Rice contains the right balance of calcium phosphorus and vitamin D to help maintain your dog's strong bones healthy joints and teeth. BETA Adult Large Breed with Turkey and Rice is made with vitamins E and C which act as antioxidants to fight free radicals and help maintain strong natural defences. High protein and reduced fat levels have been specifically adapted to help promote a lean body mass in large breed dogs. Cereals (min 4% wholegrain min. 4% rice); Meat and animal derivatives (min. 14% meats min. 4% turkey); Vegetables protein extracts; Derivatives of vegetable origin (min. 0.5% beet pulp); Oils and fats; Minerals; Vegetables (min. 0.5% chicory). With antioxidants and preserved with EC additives.